I’m 1:59 hours into a stream of House Flipper, quietly fixing up a bedroom for the enjoyment of a single viewer – who may or may not have even been watching – when the chat came to life. By the time I noticed the chat, it was unusable. All caps racial slurs were clogging Twitch’s AutoMod feature, and a baying crowd was commenting on everything from my quiet voice, to a lazy eye and my autism. Random men on the internet have been screaming at me for the length of my game journalism career, but in this specific case I was baffled. How exactly had we got here? Not sure what to stream next? Here are this year’s upcoming PC games. The answer, as it often is in these cases, was a tweet. It was a throwaway statement I had made that lacks a lot of context, responding to a tweet from PC Gamer’s editor-in-chief Evan Lahti, which a few of my friends had jumped onto. Lahti highlighted a tweet from streamer Dr DisRespect suggesting that if he didn’t get his own PUBG skin in the next five days, he’d stop playing the game. Dr DisRespect – portrayed by a former Call of Duty level designer, Guy Beahm – is a character. His interactions through social media and his stream are similar to the brand-building employed by professional wrestlers. To use wrestling parlance, Dr DisRespect, as you know him, is ‘a work’. His statement was a joke, another part of the illusion he seeks to build – but to my mind it didn’t make Lahti’s comment any less relevant. Dr DisRespect’s fanbase still take his words seriously, and they do contribute to the aura of hostility and antagonism that seems to have typified online games. Agreeing, I tweeted, alluding to the occasion when Dr DisRespect threatened to roundhouse kick PUBG’s creative director Brendan Greene after he incurred a ban from the game for deliberately team killing on his stream. From the influences that threatened to physically harm the creator of the same game after he incurred a ban for intentional teamkilling..
His threat then was a work, too, and if I hadn’t been typing it out, and then hitting send, while waiting for a respawn timer to tick down, I might have added the context it sorely needed: joke or not, a section of Dr DisRespect’s fanbase appear to take his words at their most base level. They appeared to take my words at their base level too, and over the next day I noticed a particularly hostile undercurrent to a tweet I really hadn’t put a lot of thought into. I muted the conversation and didn’t think anything of it. 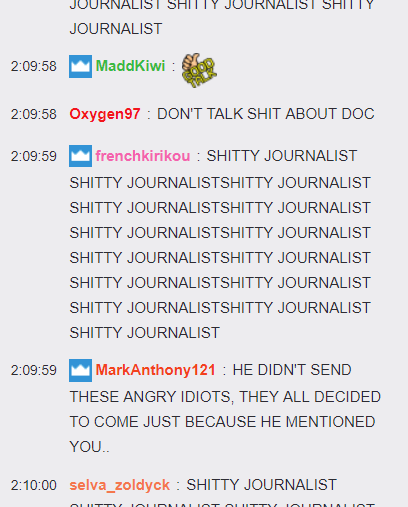 After he mentions in the first clip that I have autism, his chat immediately divides. Half of the chat seem along for the ride, while the other side start talking about autism being a serious condition, and suggesting the Doc abort. For what it’s worth, I’ve had worse cracks about autism from colleagues and close friends, so I’m not particularly bothered. But, even then, some of Dr DisRespect’s fanbase seemed to mind, as a post chastising him appeared on the subreddit dedicated to the character. But then everything went bananas. Because not only was I streaming, but Dr DisRespect had just told his audience about it. I never understood how hard popular streamers have it. I’ve never streamed for an audience of more than ten people at a time before, and my average is around three. I’m not a popular streamer. I’m not particularly good at it. But I enjoy the practice. Skip to 1hr 59min to see the raiders arrive. I wasn’t prepared for my new peak of 554 viewers, most of them screaming into my chat about my many, many, flaws – all while a few others apologised for the actions of those that were yelling abuse. It was wild, but in lieu of anything better to do, I did what any good House Flipper would do: I kept painting my walls, occasionally asking my new audience for advice on colour choices. I tried to engage with the people who showed up, but the chat was moving too fast, and was too abusive, for anything to stick. So I kept talking, tried not to get overwhelmed with the confusion, and kept painting walls, hanging a photo of Dr DisRespect on one of the walls when it became apparent that my brief moment of streaming success was because he’d inadvertently sent people my way. What was interesting is the language people were using in the chat, both to harass me and to decry that same harassment. Those who showed up, those that weren’t dropping racial slurs or personalised insults, called me a punk kid, mirroring comments that Dr DisRespect had made when he mentioned me. 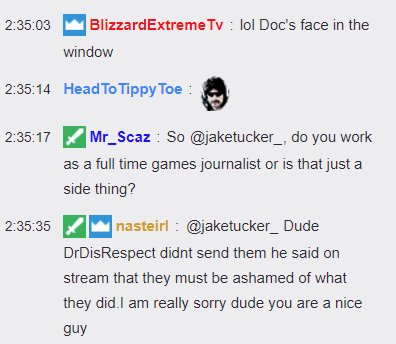 Those that spoke up against those being abusive claimed that the harassers weren’t members of the Champions Club – a name for the subscribers of Dr DisRespect’s Twitch channel – and offering me firm handshakes in solidarity. This is unusual. Because I was so bemused by the 500 people that had just appeared in my life, I just kept streaming as normal, and those that were there to see drama kick off faded away. Several expressed their apologies, with more than one person saying that they felt bad, that the harassment of their raid had gone too far. But several people stayed and, because they felt bad about what had happened, some even started donating and following me – so much so that they broke the automated follow and donate scripts I had for my channel. 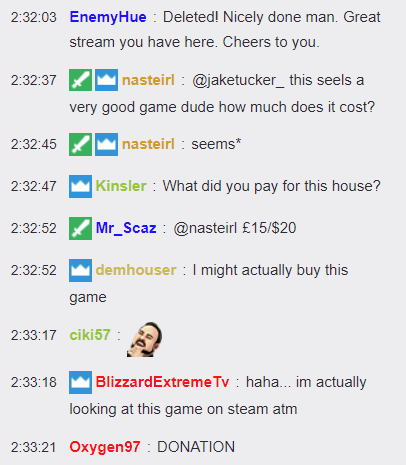 Those that hung about started to ask questions about the game, and how much it cost. People told me about what they wanted to do, with the chat asking genuine questions about my job, my streaming interests, and opening up about their own personal lives. Whenever anyone else, a latecomer, came into the chat to hurl abuse, they were silenced by people who were there to watch me fit out a house. I was just trying to make it to the end of the stream. I even ended up adding two of the most vocal critics of the harassment as mods to deal with the traffic – you won’t be surprised to learn that my channel, on which I regularly stream to no one, didn’t have mods in place prior to this. Often, when we think of an anonymous hate mob we think of shadowy figures behind a computer, but here I just felt a little sorry for those involved. 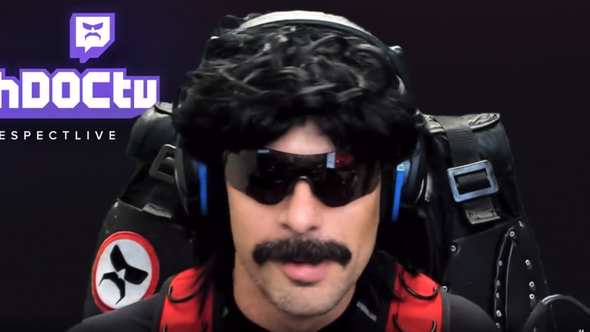 I was surprised at how many people were quick to claim that Dr DisRespect hadn’t sent them and that they had shown up of their own accord, but also at the people who came to watch the drama and then realised they weren’t happy with what was happening, trying to shame people into behaving (“Real Champions Club members wouldn’t mock someone with a disability”) and then attempting to fill the chat with positive messages. It was, without a doubt, the most surreal experience of my life. In the end, around 30 people stayed until the very end, making for one of the most positive sessions I’ve had on Twitch. While I can’t in good conscience keep any of the donations – I’ll be donating them, and the fee for this article, to Autistica, a charity for research into autism that looks at the impact of videogames – the entire event has had a weird impact. In terms of metrics, I got 100 extra followers on Twitch, and if I stream for seven unique days over the next dozen or so I’ll become a Twitch affiliate, which feels unreal. There’s something bizarre about this segment of Dr DisRespect’s fanbase coming to insult me and breaking the metrics to the point where I could now be eligible for such an accolade. It feels like some of the best and worst aspects of streaming all wrapped into one. But it’s also abundantly clear that something isn’t right with the way the streaming communities are lionising and raising up their idols – that it only takes a mention of someone’s name to send hundreds of people to their channel looking to cause trouble. An influencer’s audience is a complex thing. They are an extension of that person, often reflecting their style, but obviously they are also made up of individuals who are responsible for themselves. It can be easy to dismiss the fans of big streamers by simplifying them down to a single character type, but what I saw in the Doc Raid was a swathe of people there for different reasons. There were many there to harrass me, but I also saw a glimpse of humanity, and I’m really glad that I did – it salvaged the entire experience for me.